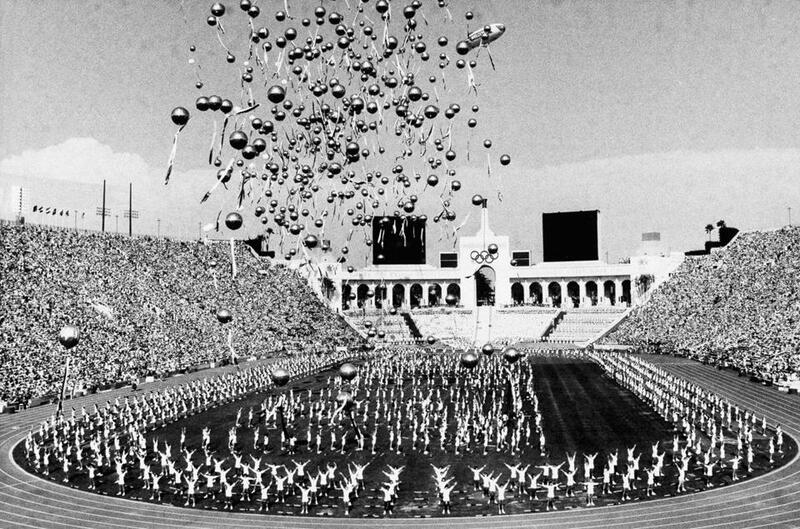 The Los Angeles Memorial Coliseum hosted the opening ceremonies for the tightly budgeted Summer Games in 1984. In 1978, the citizens of Los Angeles changed the course of US Olympic history, voting to restrict the use of public money to put on the 1984 Summer Games. The decision forced organizers to employ a new model for the Games, a spartan, privately funded event that leaned on corporate sponsorships and broadcasting fees while shunning the lavish building projects that often grace Olympic festivals, and then languish, seldom used, after the last medal is awarded. The LA Games wound up turning a profit and became the template for US Olympic bids to this day, including a Boston group’s ongoing pursuit of the 2024 Summer Olympics. By necessity, the Boston 2024 organizing group is planning a low-cost Olympics that builds as few structures as possible and makes wide use of temporary sports venues. Organizers say the plan would depend on transportation projects already approved for state funding, as well as the full-throated participation — and in some cases the money — of local colleges and universities willing to host key events. The group promoting a Boston bid for the 2024 Olympics proposes a financing plan that avoids public funds. This undertaking, in development for more than a year, is nearing a critical point: The US Olympic Committee is expected to decide in about two months whether it will bid for the 2024 Games, and, if so, which US city it will back in a worldwide competition among would-be hosts. Boston is one of four US cities in contention. USOC representatives visited here last week on a tour of the finalists, with Los Angeles, which is seeking its third Olympics, San Francisco, and Washington, D.C., also on the list. 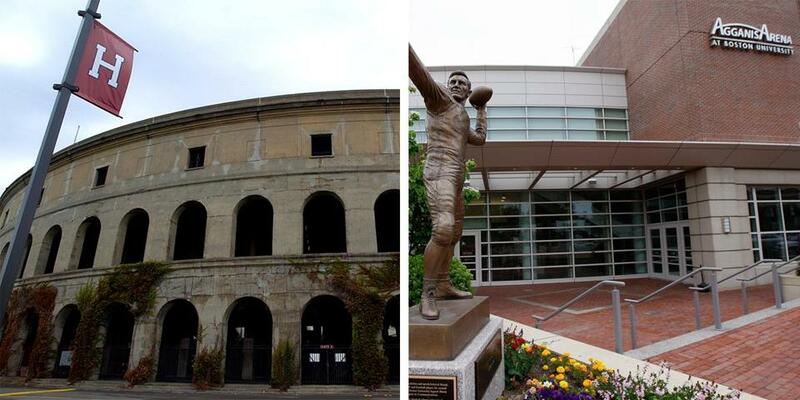 Boston’s Olympics group is hoping for access to Harvard Stadium and BU’s Agganis Arena. The International Olympic Committee is expected to select the 2024 host in 2017. Skeptics say Boston’s Olympic dreamers are fooling themselves, and a Los Angeles-style, budget-conscious, privately funded bid cannot win a vote by today’s IOC. But there are signs that Boston’s interest in the Olympics is coming at an opportune moment, at a time of change for the organization that controls the world’s most prestigious sporting event. The IOC has been battered by criticism that the Olympics are too expensive, and suffered a black eye when multiple cities dropped out of the sweepstakes for the 2022 Winter Games. Following Beijing’s $40 billion extravaganza in 2008 and Russia’s $50 billion Winter Games last February, the IOC has been stung by complaints that soon only authoritative regimes will be able to meet its demands. “Like any megacorporation, the IOC is concerned about its public image,” said Penn State professor Mark S. Dyreson, who studies sports history. And so, the organization last week unveiled a package of long-anticipated reforms. These proposals, known as Olympic Agenda 2020, are intended to make it easier and less expensive to bid for the Games. In addition to opening the door to regional bids that include more than one host city, the IOC will “actively promote the maximum use of existing facilities and the use of temporary and demountable venues,” according to the reforms, which hit a sweet spot for Boston 2024. If Boston becomes the US candidate, organizers expect to spend $50 million to refine the city’s bid and mount a worldwide lobbying campaign over the next 2½ years. Putting on an Olympics with little or no government support was not always the rule in the United States. The 1904 St. Louis Olympics got government support, Dyreson said, and Los Angeles used public money in 1932, when the city first hosted the Olympics. He said things changed with the 1976 Winter Olympics in Denver. If those games don’t ring a bell, it is because Denver — which won the right to host the Games — backed out after Colorado residents voted not to use public money for the event. Instead, US figure skater Dorothy Hamill won her gold medal in the hastily chosen backup city, Innsbruck, Austria. The US political climate today is even more hostile to massive public financing of what is a private sports festival, said Fordham University professor Mark Conrad, who studies sports business. “I can’t see a government throwing out a billion in bond issues or raising the sales tax for the Olympics — I just don’t see it,” he said. That leaves the private model. But whether it can still win a bid is up for debate. Zimbalist says Los Angeles was a unique case; the city was the only viable bidder for the 1984 Games, following three successive Olympics that were rocked by violence or burdened by debt. Despite the IOC’s new lip service to reform, Zimbalist said, he predicts a low-budget Olympics would have no chance against pricier, government-backed bids. “The IOC has always been about, ‘You’re going to honor us with glitz, you’re going to honor us with glorious facilities,’ ” Zimbalist said. Olympic specialist Lisa Delpy Neirotti, a professor of sports management at George Washington University, agreed that the IOC has snubbed scaled-down plans in recent years, such as Chicago’s 2016 bid and a 2020 proposal by Madrid, both of which were swiftly eliminated. As a potential Olympic host, Boston’s financing model proposes three categories of funding and expenses. The first involves the operational costs of planning and running an Olympics, which would be about $4.5 billion, according to several experts and to Boston 2024. This budget pays for building temporary sports venues — an estimated $1 billion — plus technology costs, administration, advertising, the workforce for the games, transportation for athletes, and other expenses needed to make the massive Olympic machine work. Current plans in Boston call for a removable stadium at Widett Circle, along Interstate 93 near Frontage Road, which — as a temporary venue — would be financed from the operations budget. The money that covers the costs in this first area would come from revenue generated by the Games themselves. Chicago’s unsuccessful bid for the 2016 Games, which were won by Rio de Janeiro, followed a model similar to what Boston is planning, according to an analysis of the bid sponsored by the Civic Federation, a nonpartisan Chicago government research organization. Its operating budget projected about $4 billion in expenses, balanced by an equal amount of operating revenue from domestic corporate sponsorships, ticket sales, private donations, the licensing of Olympic merchandise, and money the IOC shares with the host city from international sponsors and broadcast fees. The Chicago proposal also anticipated about $70 million in government subsidies for city services, expected to be repaid by federal grants and a ticket surcharge. There are risks inherent in this sort of revenue scheme. Another global recession could curtail corporate sponsorships. A terror threat could cripple ticket sales, which made up nearly 20 percent of the planned revenue for Chicago’s 2016 bid. The Chicago group intended to offset these risks by setting aside $450 million for contingencies. The IOC wants host cities to provide a financial guarantee, a requirement that has troubled US bidders in the past. Boston 2024 executive vice president Erin Murphy said in a statement that the local organizing committee would indemnify the city against possible losses. The second type of spending involves money needed for the construction or renovation of permanent sports venues. This is where local colleges can make or break the bid. For the Boston 2024 plan to work, this need must be filled by local institutions that are willing to host sporting events. Some may have to pay to upgrade facilities to meet Olympic standards, or build new facilities that would become campus amenities after the Games. In some cases, the local Olympic committee could pay to enhance college venues with temporary seating. Using as many existing facilities as possible is a cost-control strategy out of the LA ’84 playbook. “We’re proposing Harvard Stadium for field hockey; we’re not proposing to build that,” Fish said. “We’re going to use TD Bank Garden for basketball. Beach volleyball on Boston Common? That would be held in a temporary facility’’ that would come out of the operations budget. The local Olympic group has eyes on Boston College’s Conte Forum, Fish said, and on Boston University’s Agganis Arena for events. Soccer would be played at Gillette Stadium in Foxborough. Tufts University has expressed interest in a building an aquatic competition center, he said, which would be a campus recruiting tool after the Games. The Olympic village could be at University of Massachusetts Boston, which is seeking to increase dorm space, he said. One criticism of the Boston 2024 group is that much of its detailed planning is taking place out of the public eye. The group says that even if the USOC picks Boston, the International Olympic Committee would not formally recognize the nomination until next fall, giving the city most of the year to hold hearings, as the plans for possible sports venues begin to firm up. The third bundle of money is needed for public transportation improvements, the most direct cost to taxpayers. However, those costs, Fish said, are already accounted for in the state’s long-term transportation strategy. The Olympic plan will be designed to take advantage of projects already approved in a $13 billion transportation bond bill, signed by Governor Deval Patrick in April, that includes rail expansion and new MBTA trains to replace creaky old cars on the Red and Orange lines. “That money has already been allocated,” Fish said, though for Boston 2024 to meet its deadlines some of the projects may have to be accelerated. It would be up to the new governor to decide which projects are completed under the bond bill, and when. Like Chicago’s bid, the Boston 2024 plan would need the US Department of Homeland Security to designate the Olympics a “National Special Security Event,” under a federal law that puts the Secret Service in charge of security at public gatherings that could be terror targets. Congress would be expected to authorize federal money to pay for the security, though that is not guaranteed. If the Boston plan works, part of the credit would go to the man who oversaw the original LA model, Peter Ueberroth, who managed the 1984 Games and later became commissioner of Major League Baseball. Fish met with him about a month ago. Mark Arsenault can be reached at mark.arsenault@globe.com. Follow him on Twitter @bos-tonglobemark.